You are currently browsing the tag archive for the ‘Mixology Monday’ tag. I admit I was a bit intimidated by this theme at first. Sure, I’ve had cocktails that had a bar spoon or rinse of absinthe, but I had never actually just drank the stuff on its own. I know, hard to believe, but true. 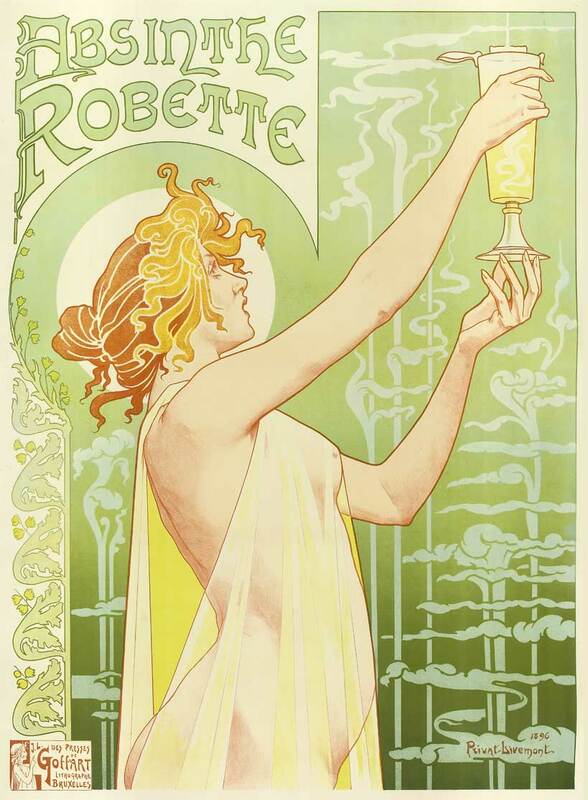 Frankly, I know more about absinthe from studying art history—it was the notoriously favorite beverage of artists in the late 19th-early 20th centuries. So, I know I am breaking the rules of Mixology Monday a bit, but instead of experimenting at home and sharing a recipe, I thought I would go to the professionals for my first absinthe, share that experience and then highlight some connections between absinthe and art. Because of the high alcohol content (up to 140 proof), it is tradition to add water and some sweetness (from a sugar cube) to absinthe. I went to Drink to enjoy la fee verte (the green fairy). 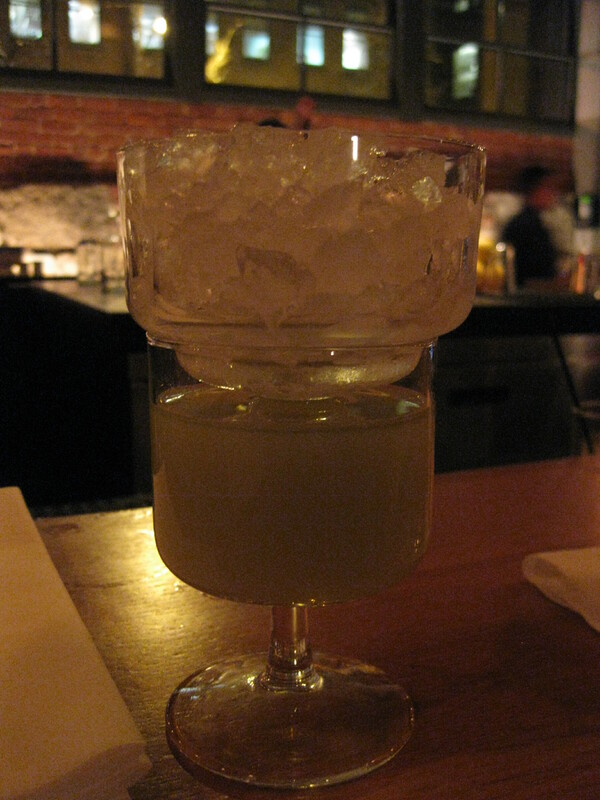 Josey poured the absinthe, St. George Verte, into a glass. Then another glass with a small hole at the bottom was placed above that. Into that glass a sugar cube was placed under crushed ice. Water was then poured over the ice. You can actually see the transformation. As the water drips and mixes with the absinthe, magic happens. The liquid changes from a crisp, clear vibrant green color, to a gorgeous cloudy pale green. Josey explained that oils which are dissolved in the absinthe during distillation react with the water. This effect is known as the “louche.” It was pretty amazing to see the change of color and consistency happen. It was almost like watching an artist mix paints to create just the right shade of green. And here is my green fairy-- ready to drink! I kind of loved it from the first sip. I was immediately reminded of two things I am very fond of—Good & Plenty candies (hello, black licorice wrapped in a candy shell) and really strong Italian cookies (my mom puts tons of anise in hers). This licorice-anise flavor comes from a variety of herbs and plants, but primarily the taste is from wormwood. Because of the potency of flavor and alcohol content, this is a sipper, but a sipper I could get used to. Its something you must try, at least once. 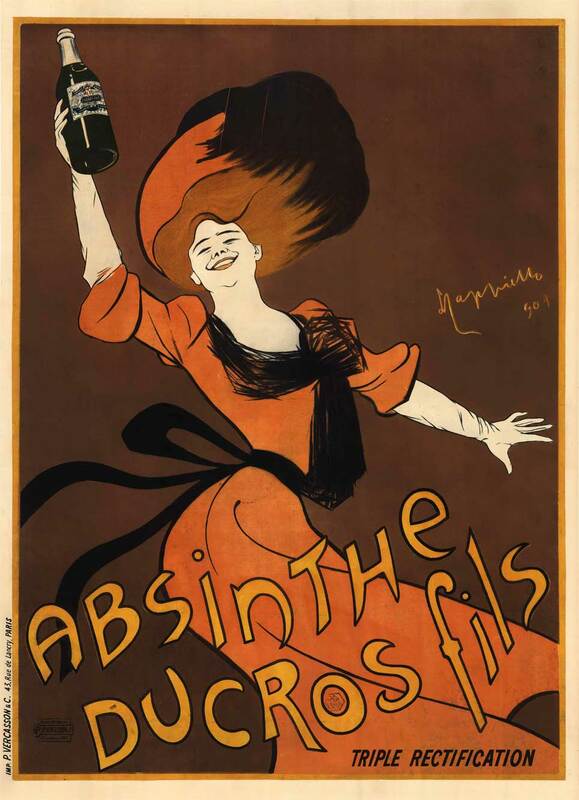 As I was drinking my absinthe, I said to my friends “I feel like Toulouse-Lautrec.” Whether these are real or imagined images, I have visions of bohemian artists sitting in smoky cafes drinking absinthe for hours on end. Originally made in Switzerland in late 18th century for (what else) medicinal purposes, absinthe quickly became popular in France. It was particularly fashionable among Parisian artists and writers—Toulouse-Lautrec, Modigliani, van Gogh, Oscar Wilde, and Charles Baudelaire to name just a few. It became so popular that the hour of 5 p.m. when people would head to the bars and cafes was called l’heure verte (“the green hour”). It seemed to consume the lives of these folks; it was even credited with acting like a muse by some artists. So, painters made lots of paintings that showed the cafe lifestyle. 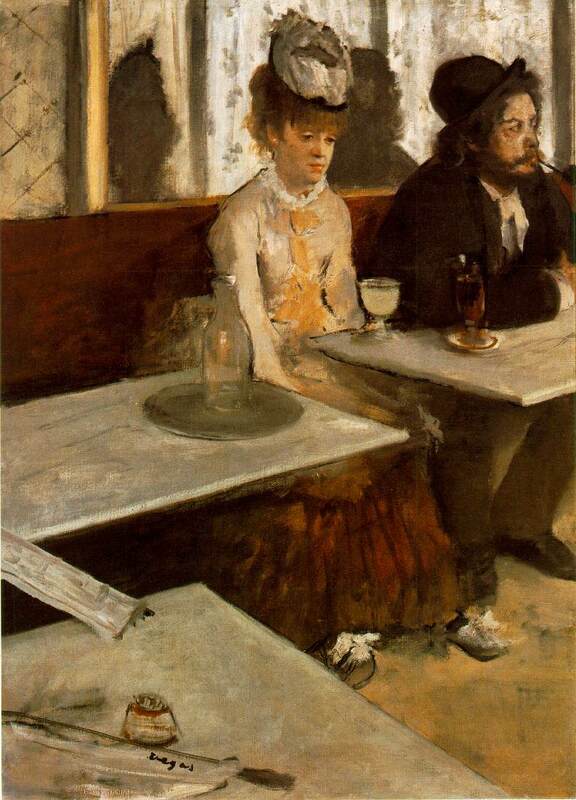 Degas’ L’Absinthe (1876) has always struck me as an incredibly sad painting. The young woman sits alone shoulders slumped forward with her drink. Her gaze is blank; she’s not quite present. And what about the man sitting next to her? They are sitting relatively close, yet there is no connection between them. She’s alone with her absinthe, he with his cigarette. Degas’ application of the paint adds to this dismal kind of mood– the brushstrokes are choppy and harsh. Not to be a downer, but this is not a picture of jovial cafe life– something else is going on here. In contrast, artists also created beautiful prints that were used in advertising. I love these! The women in these prints are stylish, exuberant, sometimes ethereal. They are perhaps the fantasy side of Degas’ reality. 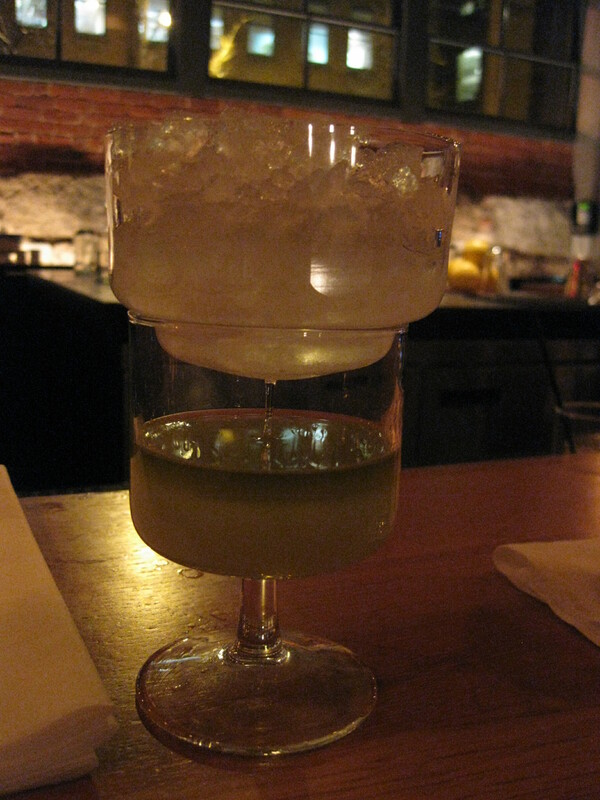 So, be brave– try absinthe on its own, in a cocktail or better yet, both. But maybe take Oscar Wilde’s advice and only have one glass. Cheers! Want one less thing on your to-do list? Subscribe to receive notifications of new posts by email, so you don't have to keep checking for the latest adventures in cocktailing.